This was my first activity with ropes and equipments after my basic course at JIM & WS in the month of April at Pahalgam, Kashimr. 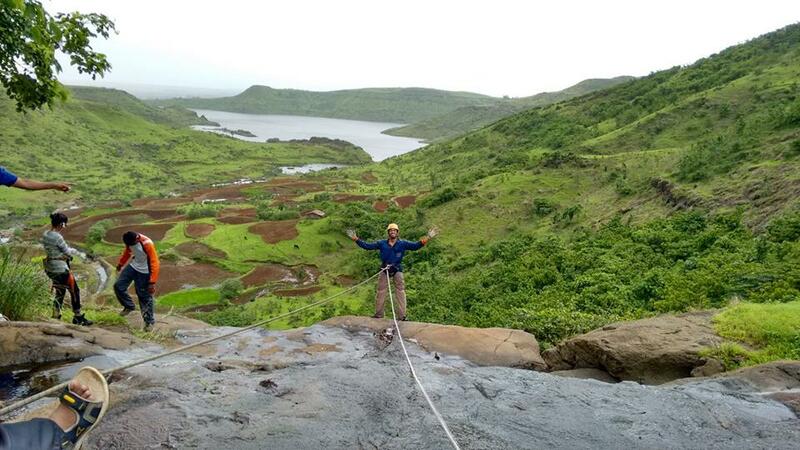 Last activity was Dukes Nose upper 350 ft. rock-climbing in the month of February, 2015. Suraj had already completed his Advance course from NIM, Uttarkashi. Pramod Chavhan Sir and Anjali Parab (tai) had also successfully completed their basic course from HMI, Darjeeling recently. They offered me a warm invitation to join the rock-climbing community visit to Bhivpuri road for a waterfall-rappelling event. I joined them without hesitation and I was among the total 9 people (all friends). Nearest railway station is Bhivpuri road. Exit from the railway track towards Karjat side and take the immediate right turn after crossing the railway tracks (safely). Road after that is pretty straightforward. People trekking to Matheran via Garbett point often use this route. 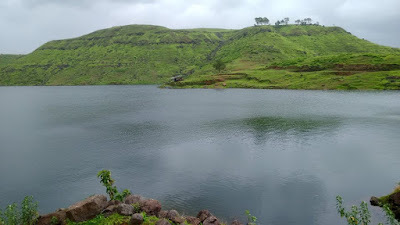 Bhivpuri is a well known weekend destination among nature lovers and trekkers. Its vicinity and closeness to the city makes it famous to the (filthy) alcoholic community as well. It was our luck that it was a Tuesday and trust me, we literally owned the place for that day!! Free from boisterous crowd !! 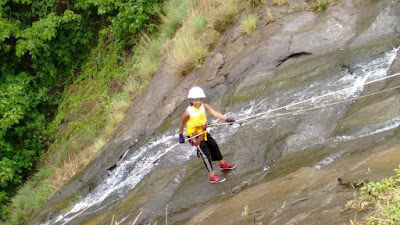 Our equipment and our gear- rappel as many times as you want !! 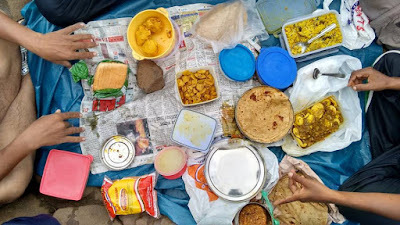 It was Pramod Sir's birthday and सेलिब्रेशन तो बनता है बॉस !! How and from where we got the Monginis cake was another long story which I wont write here! And why we all will remember this day is also another important story, a quite memorable one if you would ask me. We prepared the base with the help of a two boulders- one for rappelling and the other for belay. Due to the poor rains in July, there wasn't much water left in the waterfall. But the bare minimum was enough for our activity. 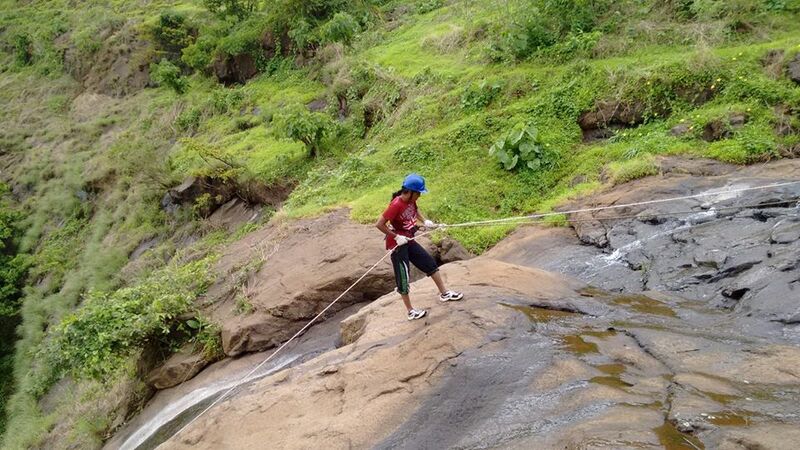 Tai went first and I gave her belay. 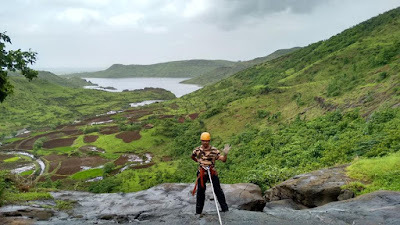 Next I went and Sameer Sir & Suraj looked after the belaying. Later, turn by turn, everyone followed. 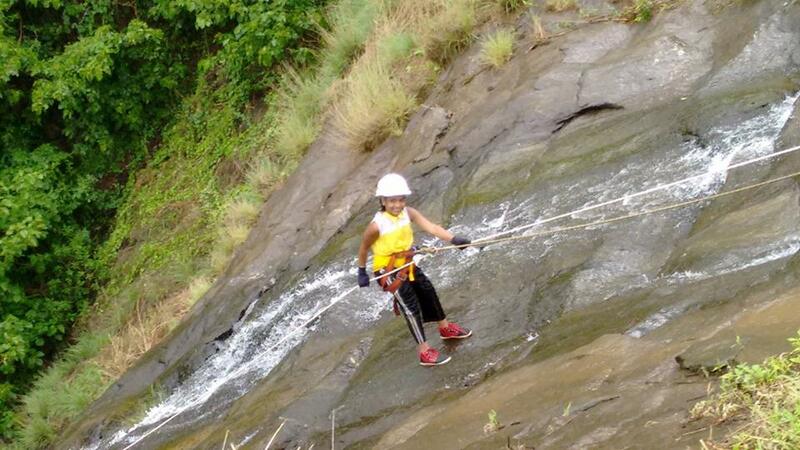 Even young Vedika wasn't afraid and completed the activity flawlessly. The intermittent rains added to the fun while rappelling. 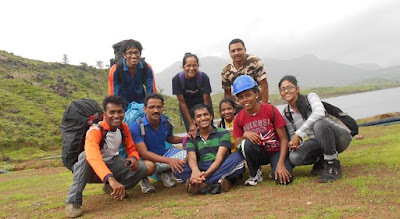 Pramod Sir did an amazing rappell (in an sarcastic way !!). We watched the video over & over & over. At about 1.30 PM Suraj asked us to start with the wrap-up. We started the rope coiling and after every equipment was gathered, every carabiners, harnesses, gloves and descenders etc were counted. After this we sat down for our lunch. While returning majority of us voted for a swim in the dam water. We searched for a safe spot and enjoyed a lot. At about 4.30 PM we started for Bhivpuri road and were back home by 7.30 PM. Note: A villager told us that the water here is not at all safe for swimming. The water from waterfall when enters the dam flows with such a tremendous force that if caught in the stream, it pulls you down. And the worst part is that the force of these monsoon streams cannot be seen from the top. Water simple appears calm. We thanked the villager and left for the station. 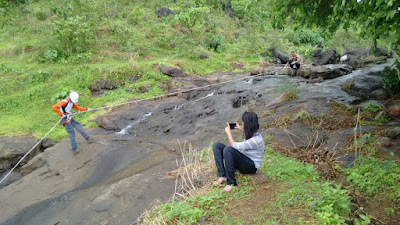 So if you plan to visit Bhivpuri, just visit the waterfall and go. But for a dip, see where the village kids are enjoying themselves.